Today I’d like to tell you a story. It’s a story about Luisa. Luisa is 23 years old and grew up in the Argentinian city of Buenos Aires. Ever since she’s been a small girl, Luisa has dreamed of being cabin crew. She would watch in wonder as planes flew overhead and dream of the day she could take to the skies. When she was 7 years old, she flew for the very first time and when she met the friendly flight attendants on-board, she knew this was the job for her. Luisa’s cousin, Valentina, also dreamed of becoming a flight attendant and, when she become 21, she applied to become cabin crew with Aerolineas. She was turned down at her first attempt, but being very determined, she worked incredibly hard on her application and at last, she was successful! She flew with Aerolineas for a couple of years and then decided to apply for Emirates. She was successful and headed off to start her new life in Dubai. Luisa loved it when her older cousin came home to visit and would sit rapt as Valentina regaled them all with tales of walking on the Great Wall of China, shopping in Fifth Avenue in New York or snorkelling at the Great Barrier Reef. And, as for the photos! Oh my, they were amazing! Luisa knew, without a shadow of a doubt, that this was the life for her. So, she decided she would apply for cabin crew with Emirates as well. But, she encountered a problem as Emirates were not recruiting at the time! No worries, she knew from Valentina that it was important to get a lot of customer service experience, so she would focus on that until the day came when Emirates started recruiting again. And, so the day came when Emirates re-opened their cabin crew recruitment and Luisa knew her time had come. She applied online and waited. And waited. And waited. She read blogs and joined Facebook groups to try and work out why she hadn’t had a response. She reached out to Valentina who told her there were technical problems with the recruitment process and it looked like Emirates would return to open days. So, she waited. And she waited. And waited some more. Then the day came when Emirates announced that they were going to hold an open day in Buenos Aires. This was it- her very big chance! She rushed off to buy a new suit, some new shoes and the all-important red lipstick. She had a CV she had written in school, so she knew she had that covered. So, she booked herself an appointment with a local photographer and got her formal and casual photos done. My goodness, this was costing her a lot of money, but surely it would be worth it to get the chance to wear the famous red hat? Imagine her horror when that evening, Luisa got a message from her friend, Sofia- who had planned to attend the Emirates open day with Luisa- to say the open day had been cancelled. Surely not? With a sinking feeling, Luisa logged on to Emirates website and sure enough, where just the day before the open day for Buenos Aires was listed, was now a total blank. This was a nightmare! But Luisa, was not anything if not determined. She looked at all the open days that were still available and one caught her eye- Madrid. Luisa knew she could get a flight from Buenos Aires to Madrid so decided to go for it. Surely Emirates couldn’t help but be impressed that she had flown across the world to attend an open day? Seeing someone this committed had to work in her favour right? So, she went on to the Aerolineas website to book her flights. Unfortunately, the open day was only 4 days away, so the flights were very, very expensive. She had some savings, so she decided to go for it. After all, Luisa was convinced no-one else would do such a journey, so this had to put her at the front of the queue. Right? Luisa quickly realised, from reading cabin crew blogs, that the assessment day was often the day after the open day and the final interview the day after this. So, she was going to have to stay for at least 4 nights in Madrid. My, this was all starting to add up, but It was all going to be worth it right? So, off Luisa headed to Europe. She had never left the Americas before, so it was a big adventure, but nothing ventured, nothing gained right? The following morning, Luisa made her way towards the hotel where the open day was being help (thanks Google maps!). It was due to start at 9am, but she couldn’t sleep for excitement, so she arrived at 7am. She was pretty sure she’d be the first one there, but no, there were hundreds of people there already. All of them dressed in a navy suit, a white blouse, hair in a bun, wearing the all-important red lipstick. The exact same as Luisa in fact! She started to feel worried. This wasn’t going to be as easy as she thought it was. She joined the very long queue and two hours later was in front of a recruiter. The time she had spent queuing had made her increasingly nervous and she felt her legs shaking as she took a seat in front of the recruiter. The recruiter asked for Luisa’s CV and then asked her why she wanted to fly with Emirates. Oh no, Luisa had not been prepared for this question. She mumbled something about them being a brilliant airline and waited for the next question. The recruiter simply thanked her for coming and told her results would be posted in next two hours. Luisa simply couldn’t believe it. No-one has asked her how she got here, what job she currently held, and she hadn’t had an opportunity to tell them that she had flown all the way from Argentina to be here. She felt sick to the stomach as she left the room and prepared to wait. However, when she thought over it all, it hadn’t gone too badly. After all, she knew she looked well-groomed, her teacher in school had told her her CV was good and ok, she had made a bit of a mess of the question, but that wouldn’t matter would it? The two- hours felt interminable as she waited for the result, but then the moment came when the recruiter came and posted a list of those who had been invited to attend the assessment day. Luisa waited until the crowd had dispersed before approaching the list. Her heart was hammering in her chest as she scanned the list desperately for her name. It wasn’t there- she had failed to get through. She had flown all this way to spend less than one minute in front of a recruiter. And she wasn’t due to fly home for another 2 days. Luisa spent the next two days wandering morosely around Madrid, taking in nothing as she despaired over her situation. She flew back to Buenos Aires the following day, feeling deeply saddened and several thousand dollars poorer. And, do you know the saddest part of Luisa’s story? It’s actually a true story and Luisa did fly over to Madrid from Argentina to attend an Emirates Open Day. Luisa reached out to me after discovering my blogs last week and asked for help. I was so saddened by her story and asked if I could share it with others and Luisa was happy to let me do this. Why do I want to share Luisa’s story? I don’t want ANYONE else to make the same mistakes that Luisa made. You see, here’s the thing. Emirates simply DON’T CARE that you have travelled many, many miles to see them. They are only interested in TWO things. ONE- that you look the part. SECONDLY, and far more importantly, that you can do the job and the way they decide this is by looking at your CV and noting down your answers to any questions that they ask you. Now, I want to give you a bit of a reality check here. It’s easy to book flights and hotel accommodation. It’s fun to go shopping for a new suit and shoes. It’s enjoyable to spend hours in front of the mirror checking out different colours of red lipstick. It’s exciting to have your friends round and practice putting your hair-up for the big day. But, and here’s the reality check for you. Doing these things will NOT get you the job. Remember, Emirates have a HUGE pool of candidates to choose from. In fact, over 97% of those who apply to become cabin crew with them will ever be successful. So, of those 1,000 people who attend an open day, only 150 will be invited to an assessment day and only 30 will be offered a job. Those other 970 will be rejected! I know why those 30 will be successful. And you probably won’t like the answer but here it comes! They know that there is more to getting this job then shopping for shoes or trying on red lipstick. They know that the secret of success is working on their CV, practising for the group activities, preparing SAR answers for the competency -based questions they know they will be asked at the final interview, or improving their video skills in preparation for their Skype interviews. They know that competition to become cabin crew with Emirates is fierce and they know that they have to put the work in to ensure success. They’re prepared to put the work in. PS- wondering what happened to Luisa? Well, she decided to become a member of New2Crew Academy. We have been working hard on her new CV, she’s stuffed it full of Emirates keywords and it’s looking good. She’s spent ages in our Emirates Executive Lounge learning all about the airline so next time she’s asked about why she wants to work for Emirates she’s got a sure-fire answer at the ready! In short, Luisa is now putting in the work she should have done the first time round and next time, we’re determined to give Luisa the happy ending she so surely now deserves. 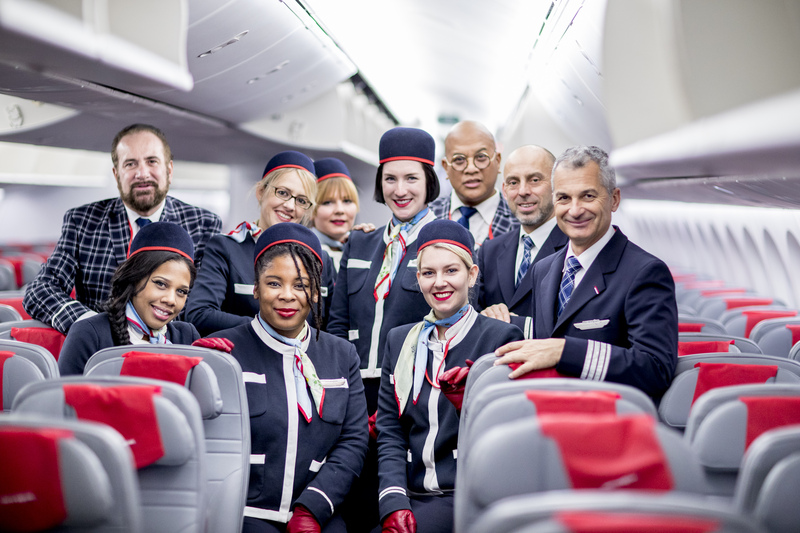 Ok, so Norwegian Airways are currently recruiting for cabin crew, so I thought I would write you a blog telling you all about their application process. You see, it wouldn’t be right if I was offering you up advice if I hadn’t gone through the process myself would it? Now, for those of you who don’t know me, my name is Pauline Park and my passion is helping people like you become cabin crew. I have extensive experience as I have been teaching Travel and Tourism for 23 years now and, in this time, I have helped 1000’s of students get their dream jobs in the travel industry. So, I applied for a job as cabin crew with Norwegian Airways using one of my alter -egos called Stephanie and I would like to share our experience with you. To be honest, there really isn’t that much to the application process. Does this mean it’s easy? No, not at all and after I’ve told you what’s involved, I’ll explain why it’s not as easy as it may appear. Please note that if you answer no to any of these questions, your application will not be taken any further. However, please DO NOT be tempted to lie as all of these requirements WILL BE CHECKED before you are offered employment. Norwegian are also quite unusual in that a swim test forms part of their assessment, so if your swimming is not the best, make sure you get loads of practice in! With these questions, you have to be able to answer yes to the first two questions. They will then expect you to have a professional working or native/ bilingual proficiency in English and you can have NO visible tattoos or piercings whilst in uniform. You also have to answer these questions above as well and then it’s time to upload some documents. These are a covering letter and your CV. This is simple stuff isn’t it? Well, it seems so but think about this. Norwegian gets 1000s of people applying to become cabin crew with them every month. And, every month 95% of them rejected! 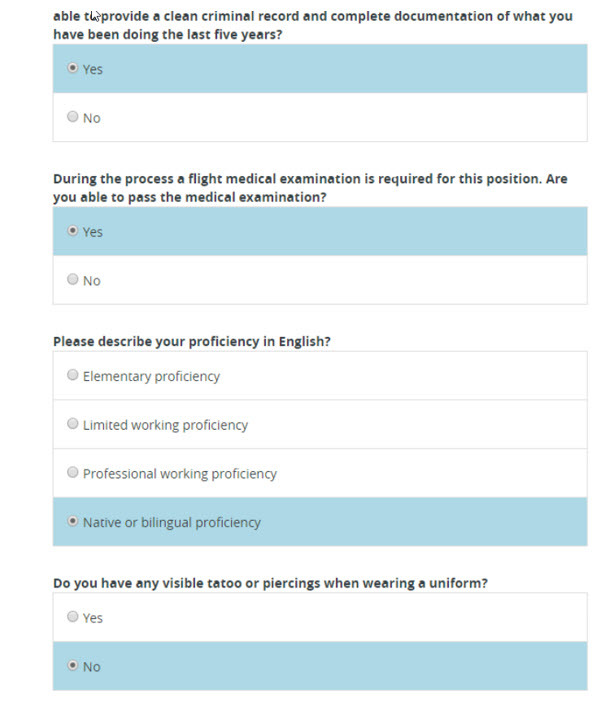 Yip, for every 100 people applying to become cabin crew with Norwegian, 95 will be rejected. Not great odds I’m sure you’ll agree. The vast, vast majority of people will be rejected at the application stage. In fact over 80% of people will be rejected at this stage. So, for every 100 people applying, only 20 will get through this stage. The vast, vast majority of people will be rejected by Norwegian at the application stage. Why is this when it seems so incredibly simple? I have written many a blog about CV’s and you can access them here, but all I will say is that once you have uploaded your CV and your covering letter there’s not much more to this application process. So, they are deciding to invite you on to the next stage of the application process based ONLY on your CV and your covering letter. In fact, I’d go one step further and say they have to be FANTASTIC! So, don’t upload a bog-standard CV and covering letter- this simply isn’t good enough. 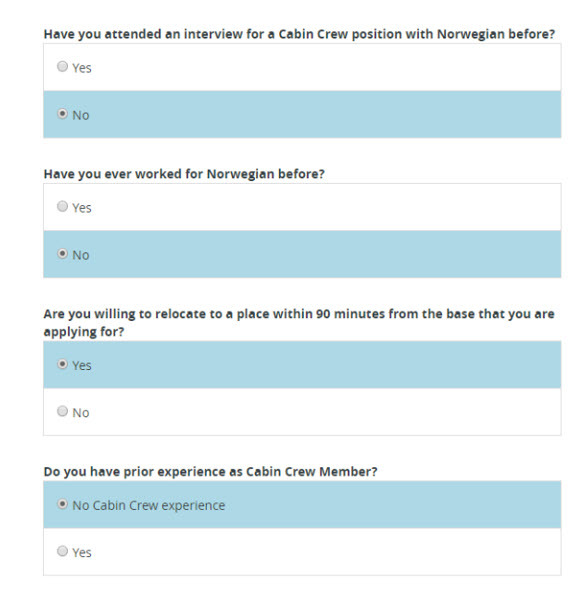 95% of applicants who apply to become Norwegian Airways cabin crew are rejected. And, the MOST COMMON REASON IS THEIR CV AND COVERING LETTER IS RUBBISH! Really good candidates with amazing work experience and who would make really good cabin crew, but are let down by using a terrible CV and covering letter. It’s simply not enough to use a CV and covering letter you wrote in school or college. Your CV and covering letter has to be absolutely tailored to the job. My Facebook group “The Departure Lounge” has loads of ex and current cabin crew who are happy to help you. The simple fact is that if your CV, covering letter are no good, you won’t even make it to the assessment day so all of your worries about lipstick or shoes or make-up are completely pointless! Focus on what’s important and here, the most important thing is your CV and covering letter. So, as I said, I have written a lot about CV’s and covering letters and I recommend you check it all out, but if there was only ONE piece of advice I could give you, it would be to make sure your CV and covering letter is stuffed full of keywords. Simple- they are the skills and characteristics that Norwegain Airways are looking for. Norwegian Airways actually GIVE THEM TO YOU! Yep, Norwegain Airways actually tell you their keywords. Now, because I am a nice person and I’ve made it my mission in life to help people like you become cabin crew, I’ll send you a specially written CV as well as a guide about fitting in keywords, just sign up below. Woo hoo- Stephanie had got through the first stage of the application process and was on her way to completing Norwegian’s online tests. FOCUS ONLY ON YOUR CV and COVERING LETTER. So, if you’re any good at arithmetic, you’ll quickly realise that 800 people (out of 1,000!) will FAIL at the application stage. I’ve also given you all the keywords Norwegian Airways are looking for. 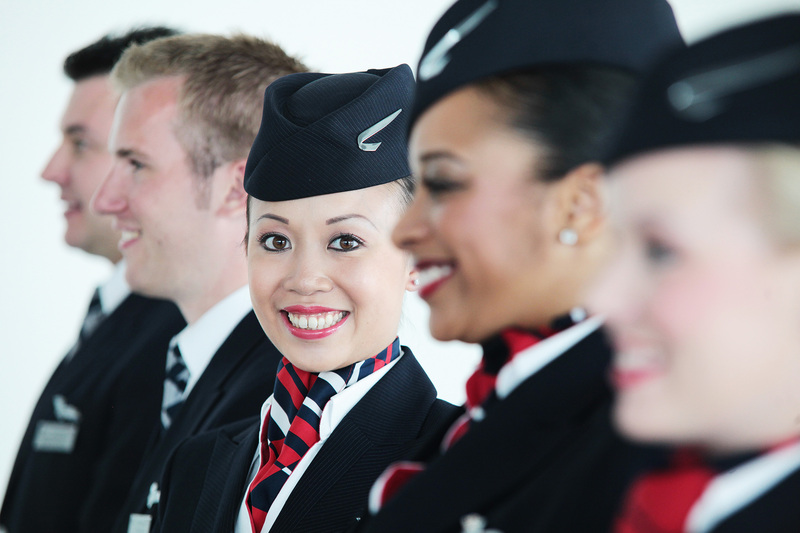 Go and get working on that AMAZING Norwegian Airways CV and covering letter. Ok, so Stephanie has just been invited to take part in Norwegian’s online tests, so let’s have a look at what’s involved. There are two tests involved. 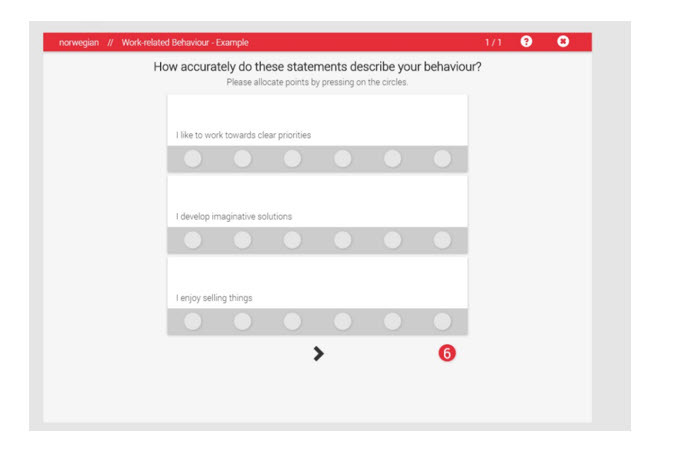 The first is a psychometric test that tries to work out if you will be a good “fit” for Norwegian Airways. The second test checks your understanding of written English. So, let’s go and look at the workplace questionnaire. You are asked a range of questions (48 of them!) and you have to allocate points to the statements. So, every screen has three different statements. You have 6 points to allocate and you need to decide where to allocate them. So, if you really agree with a statement, then you may allocate all 6 points. Or, if you agree with all three statements then you would allocate 2 points to each option. Please don’t try and second guess the airline here and give answers that they “want” to hear. 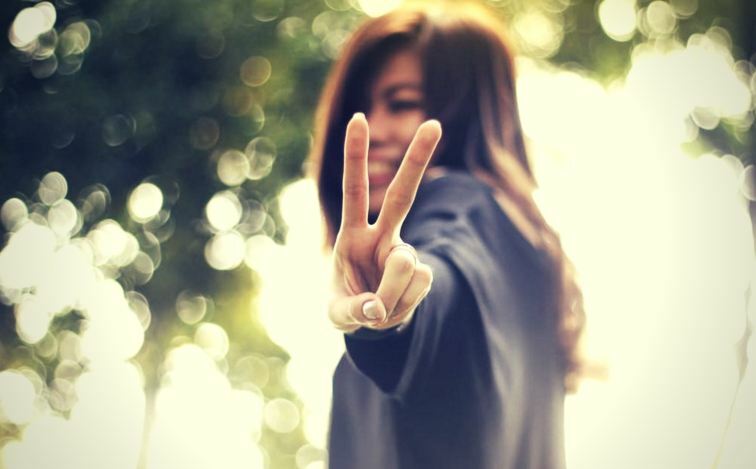 If you are not being true to yourself, then ultimately, are you making the correct career choice? So, ultimately, please just give your most honest answers. When I did it, sometimes I knew what they were looking for (like a good team player) but a lot of the time I didn’t, so my advice is just to be as honest as you can. People say you can’t practice psychometric tests and to an extent you can’t. However, an acronym known as OCEAN is often used by airlines when it comes to these tests. These are often known as the “Big 5” personality traits and they stand for openness, conscientiousness, extraversion, agreeableness and neuroticism. Airlines will generally look for a high degree of openness, conscientiousness, extraversion and agreeableness and a low degree of neuroticism so this is what you should be looking for if you do try online psychometric testing. Anyway, there are 48 screens so it does take considerable time. Good news though- it is not timed at all, so please take your time and give each statement a lot of thought when allocating points. Once you have answered these statements, you will be asked to take part in the next test. Now things get a bit more stressful here as this test is timed! There are 42 questions in total, and you only have 12 minutes to complete the test. You WON’T manage to answer all 42 questions in this time. I managed 30 and I was going pretty fast as I have done these tests before, so if you get half of them done then you’ll be doing well! If we check the text above, we can see that we cannot say if this answer is true or not, so we would click on cannot say. We then click on the arrow to move on to the next question. So, you can see why you could never answer 42 questions in 12 minutes! There is a TON of “advice” out there on the web about the new Emirates Cabin Crew recruitment process. Talk to the recruiter as if you’re talking to your lover?!! The problem is, is that there are loads of groups out there but no-one is qualified to offer advice, so you are often given really BAD advice. There is currently a Facebook group out there for people who dream of being cabin crew with Emirates and it has over 23,000 members. So, you’d think there would be loads of experts in there right? Wrong, because that’s where the advice about talking to your lover came from! So, please, please ONLY take advice from people who actually know what they’re talking about! Ok, convinced I’m the real deal? I get many questions every day about applying to become cabin crew with Emirates. So, I thought I would put together a guide to the most Frequently Asked Questions (FAQs) I encounter about Emirates. I will update these questions frequently, so if the answer you are looking for is not here, please check back soon and it may have been answered! What documents must I upload for my application? *- if you do not have these two things, they can be uploaded prior to the assessment day. However, EVERYTHING else MUST be uploaded BEFORE you submit your application. You can also upload additional documents, such as additional photos or a covering letter. However, make sure you add ALL the mandatory documents first. Help, there are technical issues with my application. What can I do? Yes, there certainly seems to be technical difficulties with Emirates recruitment site and no doubt it’s related to the sheer volume of applicants! In particular, there seems to be a huge issue relating to HireVue, the company who do the video interviews for Emirates. Many people are seeing this message, despite having already submitted their application. So, they think to themselves, well maybe they haven’t received my video interview, I’ll go and do it again. AAARRRGGGHHH- this is SO frustrating especially is there is no-one to ask for help. So, here’s what I’ve discovered. 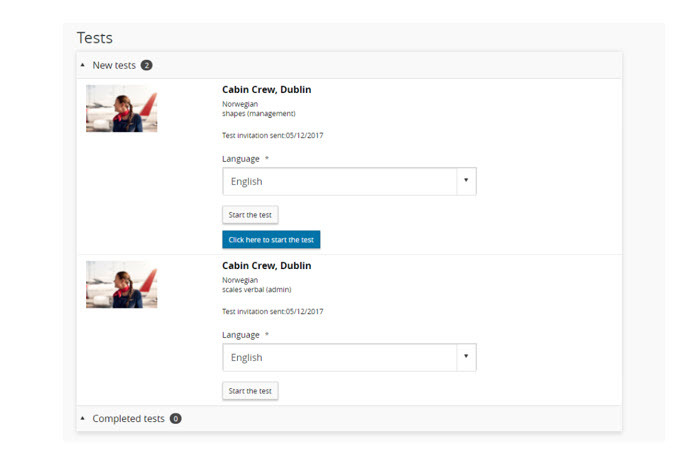 There is a disconnect between HireVue’s system and Emirates recruitment site. This is an auto-generated email and is sent as soon as your video is uploaded. If you don’t receive it, then Emirates have NOT received your video interview. There have been other technical issues with the site. It seems to be that cookies are holding on to a lot of information and applicants can’t bypass this and move on with their application. Sometimes, if you click save and continue, on the page you are on, this is enough to move on with your application. Otherwise, my advice is to log-out of that account and try on a different device. So, if you did your original application on a laptop, log-in on your phone and see if you can complete it this way. Unfortunately, there is no technical support available from Emirates. If, after trying everything above, you still can’t submit your application, the best thing would be to log-in, withdraw this application and start all over again. And hope this one is more successful! What stages does your application go through when you submit? Application received– this indicates that Emirates have received your application and it is now sitting in a queue waiting to be assessed. Not shortlisted– you have not been successful on this occasion. You can re-apply after 6 months. On hold– Emirates like the look of you. However, they can’t take your application further at this stage. This will likely be because they are planning their assessment days worldwide and have to have a certain number of candidates attending before they invite applicants. 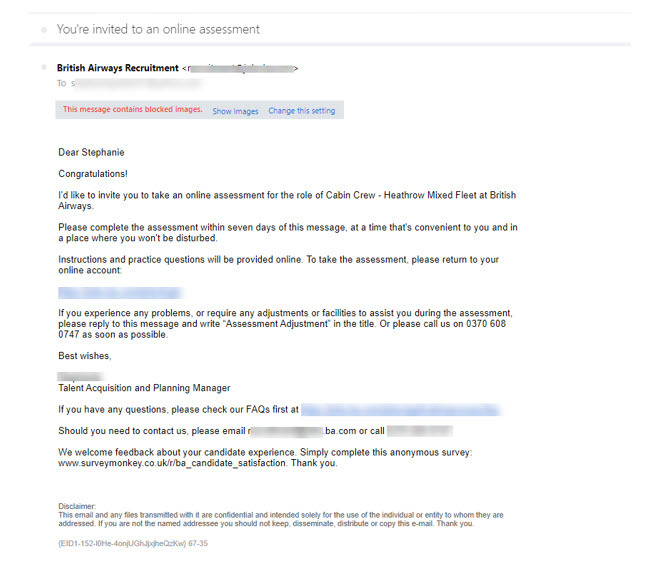 Invite to an assessment day– you have been successful at the application stage and have now been invited to attend an assessment day. How likely am I to get a job as cabin crew with Emirates? The short answer is not very! 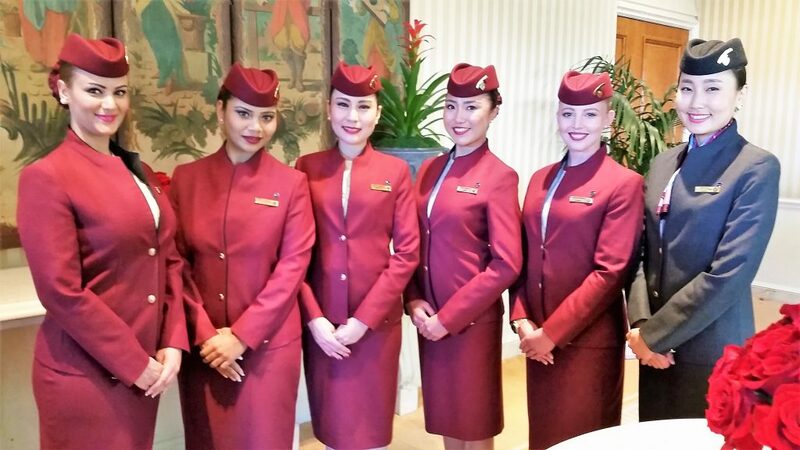 Emirates are planning on recruiting 360 new cabin crew per month. This means, over one year, Emirates will recruit 4,320. This sounds like a lot and it is. Nearly half a million applications! So, competition is FIERCE and you will have to work tirelessly to get this job. Why are keywords so important when completing your online application for Emirates? Our starting point in the whole process is finding out what the airline are looking for. 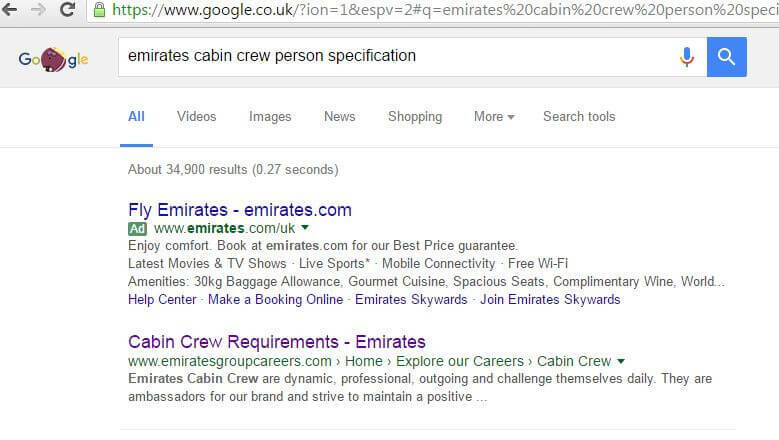 You need to trawl Emirates’ recruitment site to find out which keywords and phrases they were using to describe their “perfect” cabin crew. You see, what you want to be doing is “mirroring” Emirates’ “perfect” candidate. The more you do this, the more you will look like EXACTLY what Emirates are looking for and the more likely you are to be successful. So, use these keywords EVERYWHERE! In your CV, in your covering letter, in your application answers, in your video interview, on your assessment day. When I say everywhere, I mean EVERYWHERE! Emirates have actually GIVEN you EXACTLY what they want. How kind of them! So, your job, more than anything else, is to give show them that you have these skills and characteristics in abundance! Will I have to travel to Dubai for my assessment day? Emirates will hold assessment days worldwide. They are starting their assessment days in Dubai. However, as the process continues, they will be able to put all successful applications into a number of holding “pools” throughout various worldwide locations. It is thought that as soon as they have the requisite number of candidates for an assessment day, they will then plan an assessment day at that location and candidates on-hold for that location will be invited. Do I have to be 21 when I apply, or can I apply before this? In the past Emirates allowed you to apply a few months before your 21st birthday. The process to become cabin crew is a long one and by the time you started your training, candidates would have turned 21. However, they now stipulate on their application page that you must be 21 at the time of application. Please DO NOT apply if you are under 21. You have to complete your date of birth as part of your application, so in order to be able to complete your application you will have to give a false date of birth. Also, cabin crew HAVE to be able to follow instruction. So, by not following the instructions Emirates have given you, you are letting Emirates see that you are not suitable for cabin crew. How do I know if Emirates have received my application? This email can take a few days to be sent, so don’t worry if you don’t receive it straightaway. However, if you DON’T receive this email, then you have not submitted your application successfully. If this is the case, log back into your account and complete your application. What are the photo requirements for Emirates? Well, Emirates give you them all in GREAT detail! Please follow them carefully as failure to do so will mean that your application will be rejected. What file formats can you upload your files in? Ok, so here’s what you need to know about files to be uploaded. When you submit your application to Emirates, the first thing that happens is that it is pre-screened. Emmy and her robot friends, work behind the scenes at Emirates doing all the pre-screening and scanning of your documents. Ok, ok so there are not really robots doing all the work, but there are computer programs hard at work doing all the pre-screening. What they are doing is scanning your application for information that Emirates has asked it to look for. It then “extracts” all this information. So, when a recruiter wants to have a look at your application, what they find is all the relevant information that these “robots” have extracted. These Emirates robots CAN’T read ALL file types and Emirates have kindly provided you with a list of those that their robots CAN! So, you need to make sure that when you upload documents, they are in the file formats shown above. Don’t worry about your photos though. Please be aware though, that your photos will ONLY be looked at by a recruiter if you pass the pre-screening. 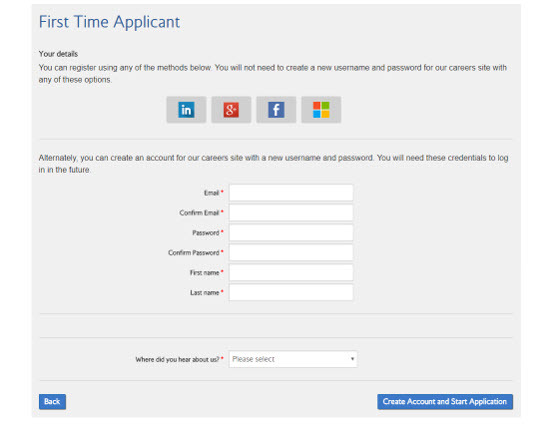 And, you can only pass the pre-screening IF you upload your CV in one of the formats above. How does the video interview work? How long will Emirates be open for recruitment? The answer is that no-one knows! Generally speaking, Emirates recruitment was always open for recruitment. It then closed twice- once for a time in 2009 and then more recently, from November 2016 to January 2018. Both times were as a result of financial issues within the company. However, they have not recruited any new cabin crew since 2016 so we can assume that they will need to replace cabin crew who have left during this time. Estimates claim that cabin crew turnover is around 20% per year. Emirates also placed a US$15.1 billion order for 40 Boeing 787 Dreamliners at the 2017 Dubai Airshow so it’s fair to say that things are looking optimistic over at Emirates and they will need considerable crew for their new aircraft and their new routes. However, when Emirates closed their recruitment suddenly in November 2016, there were approximately 900 people who had been accepted for cabin crew training whose application was never moved further. These applicants have now been contacted and asked to submit a video interview and update their work experience. Emirates reckons they will take 300 new cabin crew from this original figure of 900. These applicants will be due to start their cabin crew training in April 2018. Emirates have released information saying they plan to train 360 new cabin crew per month. This equates to 4,320 cabin crew in one year. My advice to you is to start an application with Emirates as soon as you can. No-one knows how long the job will be live for and the application link could be removed at any time. Therefore, we recommend that you start an application. You can add in your personal details and then save it as a draft. That means you still have a live application, even though there is no option for new people to apply for the post. The international language of aviation is ENGLISH. All your training is in English, your briefings will be held in English and you will communicate on board in English. There are many of you whose English is not yet fluent. Spend time improving your English. When you upload your video interview, an audio file is automatically extracted from it. When this is analysed, if your English is NOT fluent, then you will automatically be rejected. So, don’t waste your time applying for Emirates until your English is fluent. There are lots of free English courses on the web, so start using them. There are loads of great resources on the web for improving your English. The quick answer is it very much depends! However, I’m sure you want a more detailed answer. The traditional advice was that a CV should be one page, or at the maximum two. However, this advice has been turned on it’s head a bit! Your CV WON’T be read by a recruiter but instead will be scanned for information by an Applicant Tracking System (ATS) which is a computerised program that “reads” CVs and extracts important information. Because these ATS programs, or Emirates robots as I like to think of them, can “read” so quickly, you are no longer constrained by this two- page rule as humans aren’t reading your CV. So, you can get away with making your CV longer. However, your CV will be kept on file AND a human recruiter may wish to have a look at it. If that’s the case, then they WON’T be impressed by your 12- page CV! So, you have to have a happy medium! I personally would recommend that your CV is NEVER longer than 4 pages and it is stuffed FULL of Emirates’ keywords so both the robot and the recruiter are happy! Why do I have to be 21 before I can be cabin crew with Emirates? The legal age of drinking alcohol in Dubai is 21, so in order for you to lawfully be allowed to serve alcohol on-board an Emirates flight, you have to be at least 21. Can I wear jewellery in my photos? Please make sure you follow these guidelines EXACTLY. Cabin crew need to be able to follow instructions, so if you upload a photo of you wearing any jewellery, you will look like you can’t follow instructions and you will be rejected. I have written a blog about the photo guidelines and you can find it here. What make-up should I wear for my photos? I see Emirates are looking for 1+ year’s customer service experience, does this have to be continuous? No, not at all. They are asking for 1+ years customer service experience combined. So, if you add up ALL of your customer service experience and it comes to more than one year, you’re good to go! What do they mean by customer service experience. Do I have to have worked in shop or a restaurant? Not at all. When they talk about about “customers”, what they are really talking about are jobs where you have worked with the public. So, this could be a whole range of things from working in a bar, to working as a receptionist, to working as nurse. If you have worked with the public, then you have worked in customer service. This experience doesn’t have to be confined to paid jobs. If you have volunteered at all, think about this. For example, if you have worked in charity shop then this would count as customer service experience. If you have volunteered with a local youth group- all of this would count as customer service. It says you can’t photoshop or alter your photos. How do you then get a white background? It’s fine to remove the backgrounds of your photos. However, you cannot alter yourself in any of your photos. So, you cannot use photoshop to remove blemishes for example, and you cannot add any filters to your photos. Again, by doing so, you look as if you can’t follow instruction which would make you very poor cabin crew. When I am completing my work experience in the application should I just copy and paste the information from my CV? It is another opportunity to “sell” yourself using different keywords. I would probably change it up a bit from your CV if I could so that when your application is pre-screened it extracts even more information about you which may give you a higher score. Here’s a tip for you. You know how I am completely obsessed with keywords? Well, I am going to mention them again! All of Emirates application is now online and everything is now automated. This means that no-one will look at your online application. Everything will be run through a computer program and ONLY those applications that pass this will be seen by a recruiter. And what is this computer program (or as I like to think of them, Emirates robots!) looking for? In fact, before I go any further, may I introduce you to Emmy, the Emirates robot? Emmy is a good friend of mine and she’s been VERY helpful at letting me know EXACTLY what her and her robot friends are looking for during your application. They are looking for keywords so give them lots and lots and they will fall in love with you! But what does this have to do with your work experience section? This section will also be “searched” by these robots, so you want to fill it with keywords as well. So, some advice for you. At this stage, I would save my application as a draft and log-out. I would then spend some time drafting your roles and responsibilities in your current and previous jobs and make sure they are full of keywords. The old advice used to be to keep everything as brief as possible and summarise as much as you could so the recruiter could scan it quickly. However, modern technology has turned this on its head a bit. Because these programs (or Emirates robots) are such fast readers and are able to extract incredible amounts of information really, really quickly, you can actually write as much as you want. In fact, it may be the case that the more you write the better as they love to read! However, I would caution you not to write too much! If your application makes it past these Emirates robots, it will be assessed by a human recruiter and they WON’T to read pages and pages of your work experience. So, try to have a happy medium! And a good way to do this is to not write pages and pages but make sure that what you do write is FULL of keywords! That way, both the Emirates robot and the human recruiter will be pleased with you! What should I wear for my photos? If you have tattoos in ANY of the red areas above, then you CANNOT be cabin crew with Emirates. They DO NOT allow any covering on tattoos in the red area. You may be tempted to “hide” your tattoo and apply anyway. That’s your choice but I should warn you that you will have a medical in your own country and one by an aviation doctor when you arrive in Dubai. If your tattoo is discovered during your medical, your contract will be terminated. Also, if any of your fellow cabin crew report your “hidden” tattoo then you may be dismissed. Am I too old to apply to be cabin crew with Emirates? The first thing I would say is that there is no upper age limit for Emirates. That said, it will probably be a bit more difficult for you if you are older. Just because they don’t have an upper age limit doesn’t mean it you have an equal chance. They will prefer younger candidates simply because they are likely to stay with them for longer. However, you can convince them that you intend to stay for a long time! Also, the job is very physically tiring. You can be on your feet for up to 18 hours and this would exhaust anyone. Then you have to deal with the constant time differences. So, if you are older you will have to convince Emirates that you do have the stamina to deal with the job. Talk up how fit and healthy you are. If you are more mature, then you will have more experience to bring to the job, so you want to highlight this as well. You may look at photos of Emirates cabin crew and assume they are always so young. But the reality is that it is mainly young people who apply to be cabin crew in the Middle East as they enjoy living in Dubai and the constant travelling that comes with the job. However, that’s not to say that there are plenty of older crew flying with Emirates, so if you fancy it, then go for it! Am I tall enough to be cabin crew with Emirates? You have to be a minimum height of 160cms. The height restriction very much relates to the aircraft you are flying on. The bigger the aircraft, generally speaking, the taller you have to be! For flying on most commercial aircraft, the minimum height is generally 5’2” which is approximately 160cm. The maximum height is 6’2” which is 190cm. Why do they have these restrictions? Well, it’s to ensure that you can reach the emergency equipment that is carried on-board the aircraft. This emergency equipment is usually stored in the overhead lockers, so you have to be able to reach in and access this equipment in the event of an emergency. There is also a maximum height as any taller than this and you would be incredibly uncomfortable working within the confines of the cabin! Emirates also you to take part in what is known as a reach test. This involves you reaching a marker on the wall. This marker will be placed at 212cm. You have to easily be able to reach this height without wearing shoes and you can stand on your tiptoes! The reach test takes part early on in the assessment day. If you can’t reach the marker, then you cannot be employed as cabin crew and you will be asked to leave the assessment day. So, if you are worried about the reach test, is there anything you can do? Well yes, there are a few things you should do. First up, put a marker like the one on your photo on your bedroom wall. Make sure it is at 212cm. You should maybe put it a few cm’s higher so you know you will definitely reach it on the assessment day. Then practice, practice and practice some more. Each time you are practising, you are stretching which will make it easier for you on the assessment day. Now, this may sound a bit crazy, but some of my ex-students have also used yoga and pilates to help them stretch and become taller and it has worked! So, if you are very, very close to reaching 212cm, do as much stretching as you can and you may pull it off on the assessment day. Am I too fat to be cabin crew with Emirates? You will need be able to fit into a crew seat (the foldaway seat where cabin crew sit for take- off and landing) and be able to use a seatbelt WITHOUT a seatbelt extension as part of their application process. Why do they ask such a thing? Well, being cabin crew is an incredibly physical job as you are on your feet for long periods of time. You are also trained in how to deal with a range of emergency scenarios and you must be fit to be able to deal with these. Also, you are working within the confines of an enclosed aircraft cabin which can often be quite tight spaces. 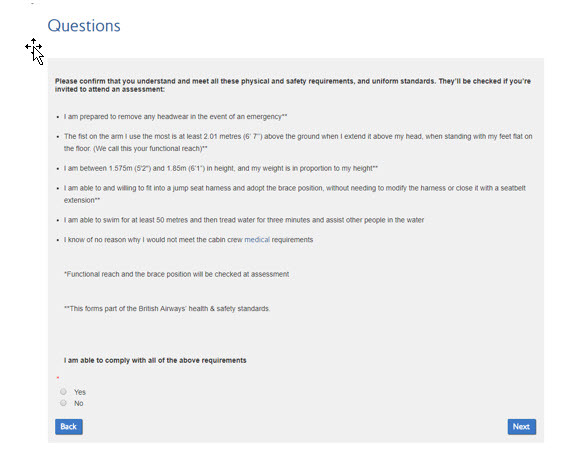 So, ultimately, because of the physical demands of the job, you cannot be overweight. So, how do airlines judge whether you are too large to be cabin crew. Airlines will expect you to have a BMI of less than 25. It’s simply your Body Mass Index which is a calculation based upon your weight and height. There are many calculators online which allow you to measure your BMI. You are aiming to have a BMI between 18.5 and 25. Anything less than 18.5 is classed as underweight and over 25 is classed as overweight. Anything over 30 is classed as obese. So, go and check out your BMI and if it is over 25, you need to think about losing some weight before applying to become cabin crew. A great way of doing this is upping your exercise. Not only will this help you drop some pounds, it will also get you fitter. The fitter and stronger you are, the more you will be able to cope with the rigours of the job so it’s a win-win situation! Can Emirates cabin crew wear glasses? Emirates don’t allow glasses at all and ask you to wear contact lenses instead. If you struggle wearing contact lenses (and many people do!) then the Emirates’ doctors will provide you with a written letter to state this and you will then be permitted to wear them. However, within their uniform and grooming guidelines, Emirates would ask that your glasses blend with their uniform. For that reason, I would suggest that if you are attending an assessment day with Emirates, you should consider wearing contact lenses. 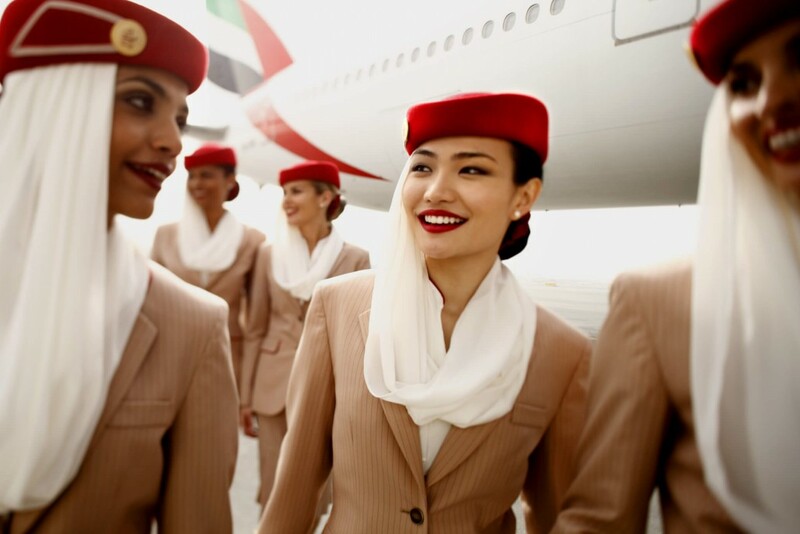 What are the cabin crew qualities Emirates are looking for? First up, although many people think the key role of cabin crew is to serve tea and coffee, it’s actually to keep people safe. Cabin crew are first and foremost, safety professionals. Think about it. You can’t call the emergency services at 36,000 feet in the air, so they have to be able to deal with a range of potential scenarios. If there’s a fire on-board, they can’t call the fire service, they have to don portable breathing equipment and deal with it themselves as a team. If someone takes a heart attack or goes into labour, they can’t call an ambulance, they have to take control of the situation themselves. If a passenger has had too much to drink, the police are not on hand to put them in handcuffs and arrest them, so the cabin crew will need to work together to restrain the passenger and restore order in the cabin. So, for these reasons, cabin crew are incredibly highly trained. As well as their initial training course which covers fire training, conflict management and first aid, cabin crew also take part in continuous training in order to keep their skills up-to-date. So, what type of skills will airlines be looking for in order to manage in any of the scenarios highlighted above? All airlines are looking for staff who are able to take control when required, able to follow procedures and can stay calm under pressure. Although cabin crew are highly trained individuals who are more than capable of dealing with a range of emergency procedures, the vast, vast majority of the time they won’t encounter emergency situations on-board. So, what other skills are they expected to have? Well, it’s important that cabin crew have empathy skills. Well, just think about the number of people cabin crew encounter on a daily basis- it’s a lot! So, cabin crew have to like people! They have to like meeting new people and they must really enjoy helping people. It’s also really important that they have good customer service skills. Ultimately, you will be working with customers day in and day out, so you need to enjoy working with a range of different people and you need to enjoy going the extra mile for them and impressing them with your level of service. Remember, cabin crew are ultimately the face of an airline, so it’s really important that they enjoy giving their passengers great service and actively enjoy helping them. Cabin crew also need to be very flexible. If you like the routine of a 9-5 job then cabin crew is most definitely not for you! Your roster will generally only be given to you one month in advance, which makes planning difficult. You may be flying to New York one week and Tokyo the next, so you have to be very adaptable and actively enjoy change. You also will work on standby which means you have to be within 90 minutes of your base airport in case you are called in for duty. So, unless you are someone who thrives in this type of environment, cabin crew may not be for you. Teamwork is massively important when working as cabin crew. You have to work with your colleagues to ensure a smooth cabin service during your passengers’ flight. Also, in any kind of emergency situation, you have to work with your colleagues to help respond to the problem. So, if you are someone who doesn’t enjoy teamwork, then you will find working as cabin crew very difficult. Cabin crew will need to have good cultural awareness and a genuine interest in working with people from all over the world, particularly if you are keen in flying with a middle Eastern airline. As you know, cabin crew are the face of the airline and, as such, have to be impeccably groomed at all times. So, if you enjoy personal grooming and looking your best at all times, then this is may be the perfect job for you! So, please, please make sure that you mention these qualities ALL THE TIME during your application and assessment day as this will help convince Emirates that you are the PERFECT person for the job. What would really, really impress Emirates would be if you can give them an example of each and every one of these characteristics! So, before you even apply to Emirates (or in fact, right now!) take 5 minutes to write down an example of when you displayed EVERY quality listed above. Then use these examples throughout your recruitment process. Do you need perfect teeth? Your teeth should be of cosmetically acceptable appearance as cabin crew are expected to smile all the time. As far as teeth are concerned, anything which does not look natural is unacceptable, including braces or noticeable missing teeth. · Teeth should be free from caries and all necessary fillings completed. · Roots etc. should have been removed. Sockets clean, uninfected and healthy. · Temporary fillings are not acceptable. · Gingiva and oral cavity to be free from infection or disease. · Teeth should be free from plaque, scaled and polished. Good level of periodontal health. · Crown and bridgework, if present, should be in good condition. · On initial examination in EK clinic, if treatment is found to be unsatisfactory or uncompleted, it will need to be restored at the patients’ expense. · Dentures, if applicable, should be in good condition and fit properly. · Wisdom teeth which are normally symptom-free (i.e. which do not compromise adjacent teeth or do not create recurrent infections) do NOT require removal. · Gaps / missing teeth do not need to be replaced by bridges etc. if posterior and unnoticeable. Can I be cabin crew and wear braces? The short answer to that is no. You cannot wear braces whilst working in cabin crew. I have known candidates to attend assessment days wearing braces. These braces were due to come off in the next couple of months, so the recruitment team asked for them to send them photos once they were removed. However, if your braces can be removed, I would recommend doing this temporarily whilst attending an assessment day. What do Emirates think of scars and birthmarks? So, first up, how worried should you be if you have scars or birthmarks? The truth is, it depends where they are! If they are under your uniform, then you really have no need to worry. Most airlines allow you to wear long-sleeved blouses, so you can request these if you are worried about scarring on your arms. However, if the scarring can’t be seen whilst in uniform, there really is no need to be worried. So, what if it can be seen? Well, it very much depends on the size and the location of the scarring or the birthmark. You can cover the scarring or birthmark with make-up. If this then means the scar or birthmark is covered, you shouldn’t have a problem. I have helped 1000s of people like you become cabin crew and I asked them the brand they would most recommend. The one that kept being mentioned over and over again was Dermablend, so it may be worth checking this out. Another one I have heard mentioned a few times is Covermark. We don’t receive any commission at all from either of these companies, I’m just telling you ones that have been recommended to me, so I hope you find them useful! Should you tell Emirates if you have scars or birthmarks? You will have to undertake a full medical if you are successful at your assessment day, so it’s best to just to be upfront about it at the assessment day and tell the truth. Emirates are only concerned about scarring as it may impact your ability to carry out your cabin crew duties, so if you can convince them that you will be perfectly able to carry out your role, you shouldn’t have a problem. I’ve got to appear on webcam ? The cabin crew video interview is all done online using a webcam. Basically you’ll be asked a number of questions which you need to record yourself answering on the webcam and send to the airline. The airline recruitment team will then review your performance and decide if they want top invite you to the Assessment Day. This blog will show you how to get that invite! What normally happens is that you are sent an email invitation from the airline. The first thing you will need to do is log-in and create an account. What if I forget my log-in details? Please take a note of your log-in details because if you have to contact the airline for a reminder they’re NOT going to be impressed! Before the video interview begins, your Internet browser will be checked. If there are any problems with the browser, you will be told. Oh, I’m sure it will be fine! Please don’t ignore this! If there is a problem then the airline WON’T be able to receive your video interview so if they tell you there is an issue, make sure you get it sorted! This screen normally includes a company video. It’s really important that you watch this as the airline can tell if you have or not! When watching the video, take notes of the key points in the video and there is no harm in watching this video two or three times- it will make you look super keen! Wait, what? There’s a closing date? 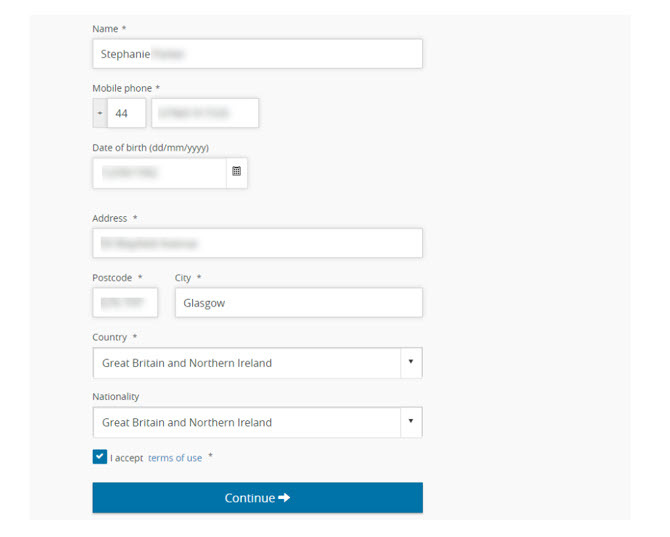 Yep, you will also find the closing date on this screen. You WON’T be able to submit your video beyond this date, so don’t ignore it otherwise you’re waiting at least six months until you can apply again! Also, there are a load of technical considerations to think about as well. So, if you log-in to do your video interview on the closing date and find out there is a problem with your webcam, then you’ve blown it! Get started planning your video interview as soon as you recive the link to give yourself plenty of time to get it right! 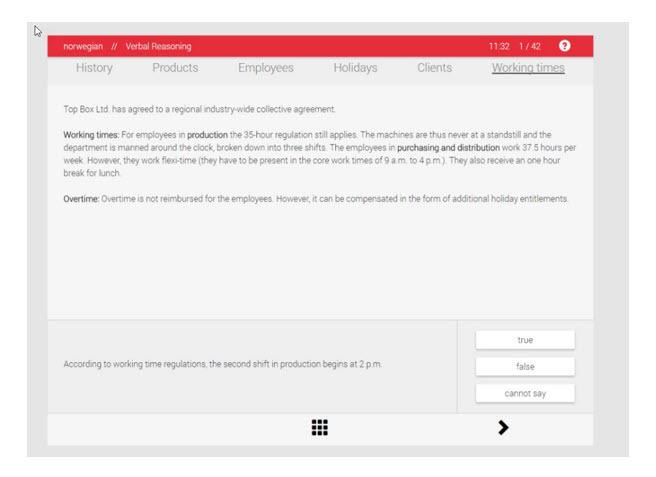 This screen will tell you how many questions are in the interview and how long you have to complete it. Oh, it’s like being back in school! And, just like in exams, plan your time wisely! If you have 5 questions and 15 minutes, then you should spend NO MORE than 3 minutes on each question. Don’t spend 10 minutes on the first question and then hardly any time on the others. Each question is EQUALLY important so give them all an equal amount of time. There is usually a section called “About this interview”. It’s really important that you read this section. Because it tells you what the airline is looking for and it’s stuffed FULL of KEYWORDS! You’ll see words such as customer experience, friendly, confident and team player. If that’s what the airline are looking for, then make sure your answers include these words as well! There is also a section on company information. Again, they can tell if this section has been opened, so please read it and take notes. Do I get a chance to see a demo.? Yip, often you will be given a chance to view a Demo. interview. ALWAYS view this, particularly if you have never done a video interview before as it will show you what’s involved and the more you know about the process, the more confident you will be. Nope, now your webcam, microphone and speakers will be tested! The key thing to remember is to make sure you run all the tests as instructed – the better your computer is working – the better you’ll look and sound. Once all of the tests are run then you can begin the practice interview. So, I can just wear my pj’s right? The clue is in the word “interview”! Remember, this is the first time the airline have seen and heard you and you want to make this first impression as good as it can possibly be! You should dress smartly. Remember how important grooming is to an airline, so you want to make sure you look the part. Ok, so we’re nearly good to go! Next thing you should consider is the lighting in the room. Make sure shadows are not being cast on your face. Make sure you have a plain background behind you if at all possible as the cabin crew recruiters may be too busy checking out your family photos rather than listening to your well-thought out answers! Finally, and MOST importantly, make sure there are NO distractions! If you interrup or stop the video interview YOU CANNOT RESTART IT! So, once you begin, you only have ONE chance of completing it. Therefore, make sure you will NOT be interrupted. Tell your friends, family, flatmates or your granny that you are taking part in a video interview and they CANNOT disturb you! Turn OFF all phones, disconnect the doorbell and if your dog is likely to bark, move him to a different room! Ok, so now we’re good to go! Can I practice first of all? You will be given the opportunity to try a couple of practice questions first of all, to give the chance to feel comfortable talking to your webcam, so make the most of this practice! Then it’s time for the interview. You are normally given between 15 and 60 seconds to read the question before recording begins, so use it to read through the question a couple of times and then take a couple of deep breaths before you begin. Treat this video interview EXACTLY the same as you would any other job interview. Take your time answering questions, speak slowly and clearly and keep your body language postive at all times. So, make sure you have prepared REALLY detailed answers for these questions beforehand. Make good eye contact with the webcam (imagine it is the recruiter) and keep smiling throughout! I really hope this blog has helped you and yo have any questions please post them in the comments section below and I’ll get back to you! 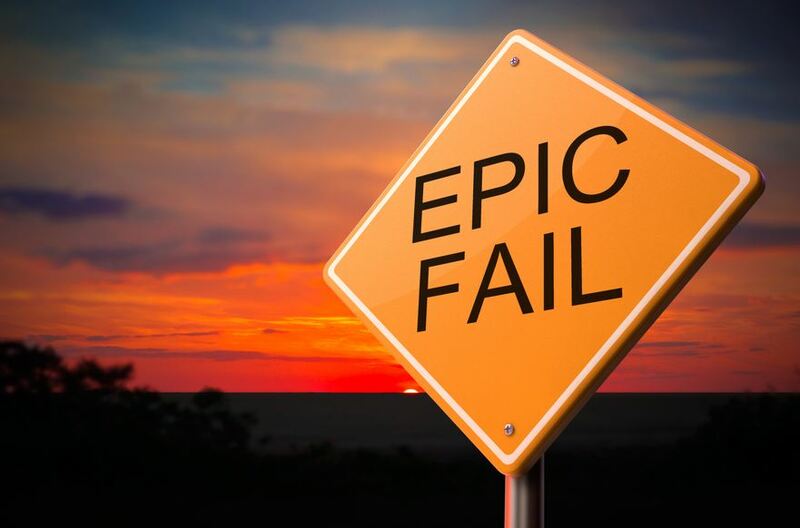 There is one simple reason why I have written this blog for you – my frustration at watching really good candidates not being able to get their dream job because of the most basic mistakes at the Emirates Open Day. Reading this blog and sticking to all of the rules you find it in will put you ahead of the competition- way ahead! Would you like a career that flies you to major cities all over world? And, when you arrive, you have a room waiting for you in a five star hotel AND you’re given local currency to do some serious spending! This same career pays for your living accommodation, bills and takes you to and from work! All whilst you are living in one of the most exciting cities in the world full of beaches, shopping, resturants, bars and so much more! Add to this free medical insurance, thirty days paid holidays, free leave tickets so you can jet off somewhere exotic on your hols, end of service bonus- oh, I could go on and on! Now I know this sounds like something from a celebrity gossip magazine, but believe it or not, this is reality for Emirates cabin crew! Everything I have just mentioned is part of the benefits package for all new crew and the great news is that Emirates, as a rapidly expanding airline, are always on the look-out for new members of cabin crew which is great news for you. Life as crew is FANTASTIC and the opportunities it will provide you with are incredible. One of my ex-students, Kirsty, is now living the high-life out in Dubai and she has very kindly agreed to give you a peek at her incredible life- I warn you now, you will be jealous! I’m sorry to say that the VAST majority of applicants that turn up at Emirates Open Days are not successful. 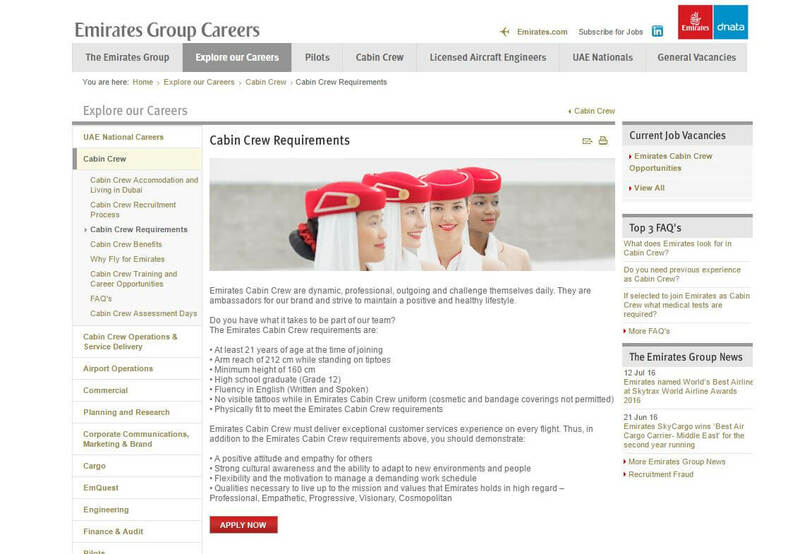 Typcially, of 100 people who apply to become cabin crew with Emirates, only 2 or 3 will be successful. Yep, you read that right- of those who turn up at the Open Day, only 2-3% will be successful. But, do you know the mad thing? The VAST, VAST majority of people are turning up for these Open Days completely unprepared, which is GREAT news for you! Why great news? Well, if you follow the advice I’m going to give you in this (and subsequent blogs) then you will be totally prepared and know EXACTLY what the recruiters are looking for. So, you’ll be well ahead of the other 97 candidates who just haven’t bothered! Do you really think that Emirates is going to give such an amazing job to people who just turn up at Open Days without having prepared? Of course they’re not, so that’s why you’re going to be at such an advantage. Is this unfair? Of course it is, but hey, if you’re prepared to put in the work then you should be rewarded for it shouldn’t you? Now, I’m not going to lie. Getting a job with Emirates is going to be a LOT of hard work, but I’m sure you’ll agree that all of the work you’re going to have to put in will be worth it in order to secure the “Golden Call” when Emirates call to offer you the job! 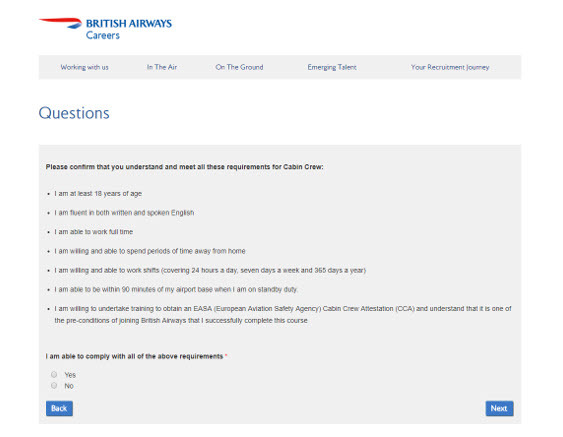 Well, it probably makes sense to have a think about the role of cabin crew with Emirates, as every answer you give at your Open Day and beyond should relate to the skills that Emirates are looking for. The first thing you need to realise is that you are trying to become cabin crew for one of the world’s most PRESTIGIOUS airlines. So, the first step is having a clear understanding of what the job requires and what will be expected of you. Emirates has built its reputation on uncompromising luxury, service and presentation to its passengers. Emirates will rely on you to provide the extremely high level of service its passengers are accustomed to. Now you know now what the benefits the job brings, so you have to understand that with those benefits come strict standards and VERY high expectations from its employees. You are THE face of customer service and so you are the most important part of the airline. Remember , passengers are paying a premium for flying with Emirates and when they consider their experience, who will they remember? It won’t be the pilot, sitting up front, flying the plane and making the odd passenger announcement. It won’t be the guy who checked you in, took your boarding pass and wished you a pleasant flight. Nor will it be the baggage handler who made sure your bag made it to the flight on-time. No, passengers will remember YOU and your fellow cabin crew members and the service you offered them on-board. Passengers will remember YOU and your fellow cabin crew members and the service you offered them on-board. Studies show that the single biggest negative memory passengers retain from a flight is an unfriendly experience with cabin crew. Passengers will forget about long delays, bad food and cramped seats but will NEVER forget bad service. You will be expected to provide OUTSTANDING customer service on long flights all around the world. It won’t matter what time of day it is, how long you have been on your feet or whether you’ve now been awake for more than 24 hours- if a passenger in 23C wants some champagne then you have to serve it to them with a SMILE on your face. You will also be trained for any emergency you encounter on-board, so you must be able to remain calm and composed at all time. In an emergency situation, your passengers will look to you for guidance and you must be able to provide it. Well, these are some of the qualities that Emirates recruiters are looking for, so you MUST be able to convince them that you are capable of this and SO MUCH MORE. So, you need to ensure that everything you say and do during your Open Day must reinforce these qualities and prove to the recruiters that you have them in abundance. I am asked all the time about how the Emirates interview process works, so in my next blog I am going to tell you in great detail EXACTLY what’s involved. If you haven’t already joined The Departure Lounge then you might miss out on my next blog but you are definitely missing out on loads of free resources including our new Facebook group where you can ask our team of experts anything you want about getting a job. Click below to join The Departure Lounge for free.